In the 50 plus years since Jane Jacobs coined the phrase “eyes on the street”, most planners have taken it as an article of faith. After all, some argue, it is common sense. But as we found out when looking at complex, self-organising systems such as cities, common sense is woefully inadequate to explain, let alone predict, outcomes. 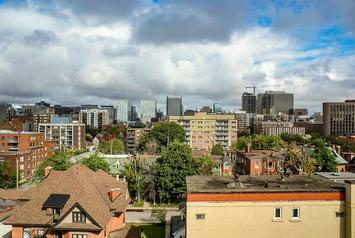 I live in an ideal Jacobsian neighbourhood: Centertown, Ottawa. Centertown has the second highest density among city districts, the widest mix of land uses, and an unmatched range of incomes and ethnic backgrounds. It is laid out on a grid and includes buildings that span the entire gamut of types, functions, forms, and history; no other ward in this city is as diverse. Yet, something essential is missing from the anticipated outcomes of an urban fabric such as this—security. Here we seek to find out why. This district has at least three east-west and four north-south “main street” arteries, where small businesses thrive, professional services are offered, and numerous people live above shops, just as in Jane Jacobs’ actual Manhattan neighborhoods. Invariably, these streets buzz with activity all day. Routine destinations are within a ten to twenty minute walk. Everything that the “eyes on the street” neighbourhood model recommends is present. As theory has it, improved security should be a natural, expected outcome. Figure 1. 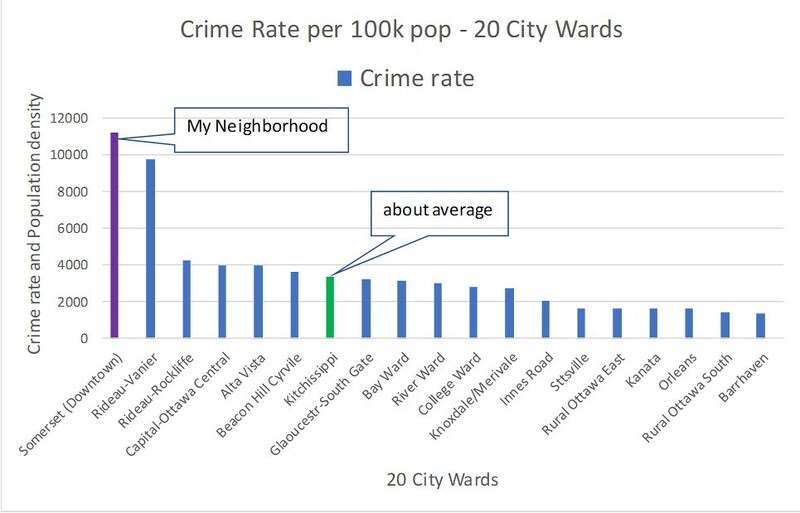 Crime rate in 19 city wards including the one where I live. Yet I live in the most dangerous neighbourhood of my city—not by mere percentage points but a manyfold difference. And, surprisingly, this abnormal difference belies the fact that Ottawa registers the second lowest crime rate among the top eight major Census Metropolitan Areas in Canada. How can that be explained, knowing that no other district in this city comes even close to its level of “eyes on the street” potential? By contrast, and belittling theory, Barhaven (a suburban neighhorhood in the southwest of Ottawa) has the lowest crime rate. Perhaps research has answers to this baffling incongruity. In a Jane Jacobs biography titled Eyes on the Street, the question of whether "eyes on the street" reduces crime is professionally disputed. A single study can be disputed as a basis for drawing credible conclusions, but the results of a meta-study are usually reliable. Whatever research could unveil would be interesting academically. My mission is closer to home. I live in an Alchemist’s jar with a mix of ingredients presumed to produce safety gold but instead it delivers lead. Transmutation attempts failed because the nature of elements was misunderstood. Could this be the case of the factors that nurture crime in a neighbourhood? New York’s West Village and my district share certain physical characteristics that purportedly increase safety: density, diversity of built form, and proximity to daily destinations. These were also defining characteristics of most cities in history but, in notable cases, with strikingly different streetscapes than contemporary ones. For example, a thriving commercial port city, Pompeii, representative of a Roman period (~50 AD), had 11,000 people in its small, walled-in area—over triple Centertown’s density. But its streets could hardly differ more from those I tread on daily: narrow, leafless, drab, malodorous, and ominous, particularly after dusk. No windows faced the street, just the infrequent opaque door—an ideal setting for illicit activity. Similar streetscapes prevailed in Fez (still intact), the largest city in the world around 1100 AD (~ 200 k pop), and a major commercial and cultural centre. 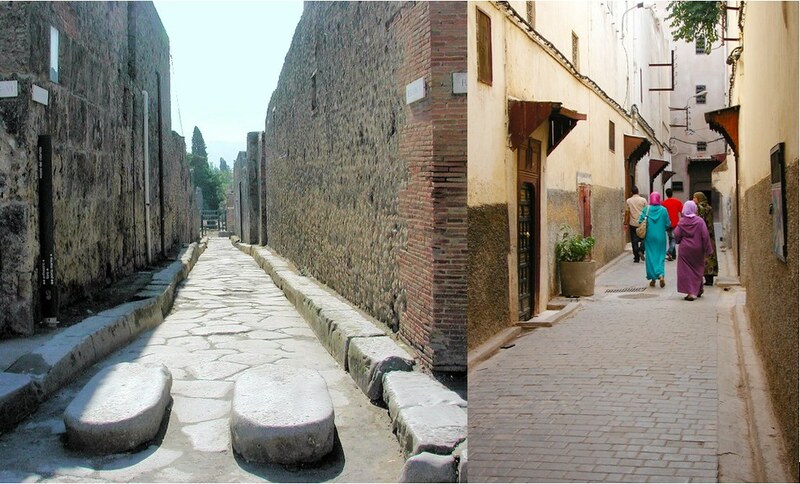 Its streets were laid out in a perplexing maze and were just as narrow and opaque as Pompeii’s. Small windows were put, by code, above pedestrian eye level to prevent prying into houses. Such streets and layouts were common in ancient and medieval cities. Not only were they opaque and crooked, they were also empty. Most streets functioned simply as necessary conduits, not places for socializing. Lacking any casual, informal surveillance, districts such as these must have been most antisocial, dreary, even deadly places. This was decidedly not the case, history tells us - in fact, it was quite the opposite. People in these cities were close-knit, bonded by religion, tradition, familial relations, and customs. It seems that neither research, nor history, nor the Centertown case statistics, support the “eyes on the street” proposition. While the Roman and Arab court-centered buildings without windows blocked eyes from the street, contemporary houses achieve the same effect with a variety of means appropriate for them—distance, walls, fences, hedges, and elaborate curtains. Most vulnerable to intrusion are detached houses and, among them, those at street corners. The rationale for these commonplace measures is explained in Jacobs’ book: “Privacy is precious in cities. It is indispensable. Perhaps it is precious and indispensable everywhere, but in most places you cannot get it.[…]”. Figure 3. A common corner house hedge treatment that avoids all contact with pedestrians or cars ensuring maximum privacy and minimum distraction by shunning eyes from the street. Streets and the buildings that frame them, including their functions, are but the stage on which uncivil, offensive acts are performed; it is human actors that carry them out. These actors form the intricate social fabric of a neighbourhood—each actor with their individual, but always invisible, characteristics. The same built form could house populations with starkly different characteristics over time, as districts evolve, and produce distinct safety outcomes. Perhaps it is the social fabric that could unravel the mystery of Centertown. It has been repeatedly shown that poverty and its related conditions are associated with errant behaviour in its many guises. Figure 4. As the median neighbourhood income increases crime rate drops. Median income values could result from relatively uniform or widely ranging incomes, potentially hiding part of the social fabric’s texture. 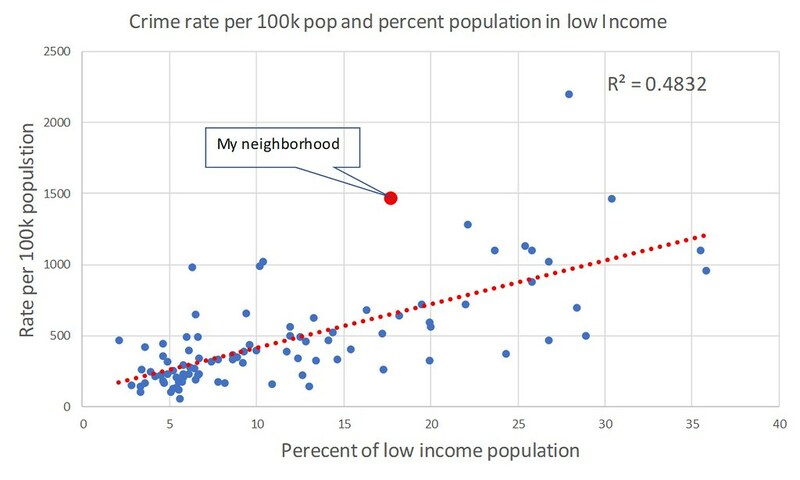 Another measure of neighbourhood income—the percentage of people living in low-income —might spotlight the difference of incomes within a neighbourhood. 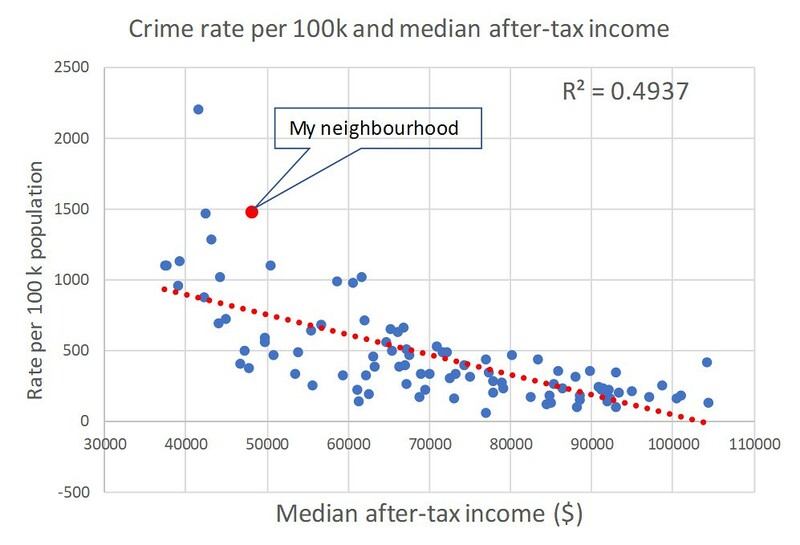 Combining the evidence from these two strong correlations leads to the realization that the social fabric of a neighbourhood is a much better predictor of its relative crime level than its physical fabric. It does not eliminate the physical factors; it simply reduces their degree of importance for this outcome. Other social fabric descriptors, such as education, employment, Gini coefficient, cohesion, and more could add explanatory power to social fabric as a determinant of the frequency of antisocial acts. Equipped with such power, we might be able to say, "show me the social characteristics of your neighbourhood and I will tell you the odds of being victimized." I was victimized twice in this Jacobsian neighbourhood and now I understand why. This piece first appeared in Planetizen.